A photo of Lt. John Pike became known on the Internet as the "Casually Pepper-Spray Everything Cop" meme. 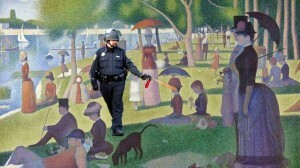 In this case, he has been inserted into Georges Surat's "A Sunday Afternoon on the Island of La Grande Jatte." “I have spent the last day reading the extensive report spearheaded by former state Supreme Court Justice Cruz Reynoso regarding the UC Davis pepper spray incident of Nov. 18, 2011. I would like to thank the task force for their thoughtful and deliberate process. “This long-awaited report gives a comprehensive account of what occurred that grave day at UC Davis, and provides specific recommendations for moving forward from this incident as a campus and a community. I have personally spoken with Chancellor Linda Katehi and am confident that what we have all learned from the report will be incorporated quickly to prevent a future recurrence. Videos of the incident, which went viral and sparked widespread outrage, showed Lt. John Pike pepper-spraying student protesters who were sitting motionless on the ground. The report was critical of UC Davis Police Chief Annette Spicuzza, who has since resigned, as well as Pike and Katehi.